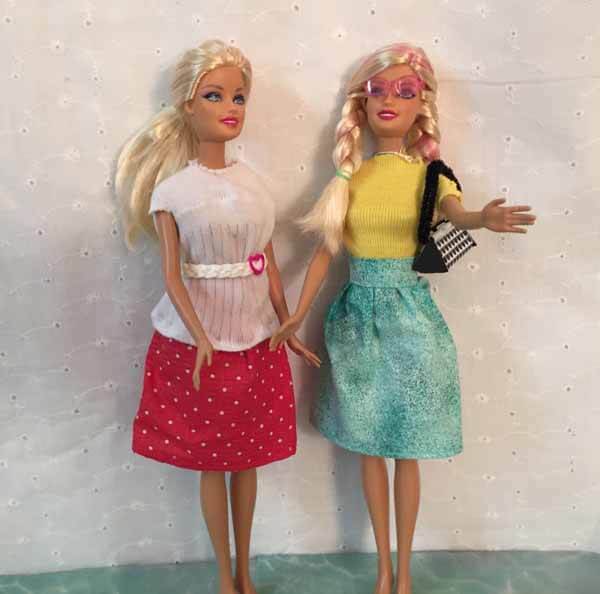 Learn how to sew a quick and easy skirt for a Barbie doll. Some purchased doll clothes patterns are very confusing and complicated. This doll skirt is Soooo easy; it can be made without a pattern. 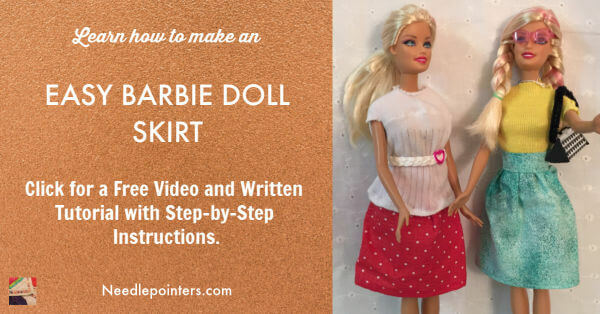 Watch this video tutorial and read on to see how to make a Barbie doll skirt. Click to watch the Barbie Doll Skirt video in Youtube. Fold the waistband fabric with right sides together and press. Fold the raw edge of the fabric toward the fold and press. Do the same with the other raw edge. Sew each end of the waistband using a 1/4" seam, back-tacking to secure the stitches. Turn right side out and press. Place the 4 1/2" x 11" fabric on the ironing board with right side down. On the short sides (these are the back of the skirt), turn fabric under 1/4" to the wrong side and press. Turn it under a 1/4" a second time and press again. Stitch down close to the fold on both short sides. To hem the skirt, turn one long edge under 1/4" to the wrong side and press. Turn under 1/4" a second time and press again. Stitch hem down close to the fold. With a needle and thread, hand baste along the top of the skirt. Hand basting is sewing with big stitches. After basting, gather the top of the skirt so it fits inside the waistband. To prevent the gathering from unraveling, take a couple of small stitches and knot the thread. Tuck the gathered skirt into the waistband and pin in place. Sew close to the inside fold, back-tacking at the beginning and end. Place one piece of Velcro along the back opening on the right side of the skirt close to the edge. Place the other piece of Velcro, along the back opening on the wrong side of the other end of the skirt close to the edge. The skirt is done. Put the skirt on Barbie and enjoy. After you are familiar with this skirt tutorial; you can whip up a skirt in about an hour. Make Barbie colorful skirt for all occasions.